Bryce Harper is baseball's biggest hothead player, according to ejection statistics. Big Papi previously held the title, but with David Ortiz's impending retirement, along with fellow former top-10 hothead Torii Hunter leaving the game, it's time to recalibrate and reevaluate our Ejection Rate study. Jerry Meals, is the league's #1 hothead player. 1 (MLB's Biggest Hothead Player). Bryce Harper - 77 GPE. 2 (Hothead Player Runner-Up). Matt Kemp - 106 GPE. 3 (The Bronze Hothead). Yunel Escobar - 134 GPE. 4. BJ / Melvin Upton, Jr. - 135 GPE. 5. Manny Machado - 157 GPE. 6. Joey Votto - 163 GPE. 7. Troy Tulowitzki - 186 GPE. 8. AJ Pierzynski - 199 GPE. 9. Justin Upton - 201 GPE. 10. Carlos Gomez - 215 GPE. Sean Rodriguez - 260 GPE, Miguel Cabrera - 279 GPE. In sum, only six players in the game today beat out the "Papi line" of 175 GPE: Harper, Kemp, Yunel Escobar, Melvin Upton, Machado, and Votto. Others, like Francisco Cervelli, have played fewer than 500 games over a span of many seasons (Cervelli has been active since 2008, but never played over 100 games per season until 2015), but otherwise would have made the list (Cervelli's GPE is 194); Yasiel Puig, for instance, holds a 117 GPE, which would place him in third place between Kemp and Y Escobar, but has played fewer than 400 games. Harper also holds the dubious distinction of being the only MLB player with at least two full seasons of service to have been ejected at least once every calendar year during which he appeared in the Majors, dating back to his 2012 debut (note: Harper's 2014 Spring Training ejection was not included in the above GPE calculation). 2012: Ejection 143 - CB Bucknor (2). 2013: Ejection 027 - John Hirschbeck (1); Ejection 096 - Hunter Wendelstedt (3). 2014: Ejection S7 - Jeff Gosney (Spring Training 1). 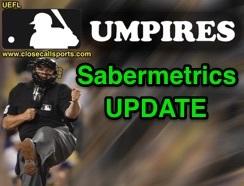 2015: Ejections 043 - Rob Drake (1); Ejection 051 - Marvin Hudson (1); Ejection 140 - Jerry Meals (2). With his latest ejection, Harper passed Gary Sheffield (78 GPE), but has some work to do to match the modern era's hothead leader, Milton Bradley, whose 55 GPE is tops for all in the 21st century. *PITCHERS: GPE is particularly tricky or misleading for pitchers, as a regular starter may only appear in 30 games per season yet sits on the bench for a majority of other games. For instance, Clayton Kershaw has pitched in about 250 games and holds three ejections since coming into the league in 2008, meaning his GPE is 83. Jake Peavy, another starter, has four ejections over 362 games pitched, or a 91 GPE. Jonathan Papelbon—a closer—on the other hand has three ejections over 650 games, or a 217 GPE. Nonetheless, we know the biggest hothead [starting] pitcher in baseball is Yordano Ventura (68 games pitched, 2 ejections = 34 GPE).